If you’re looking for cheap Generic Ink cartridges in Adelaide or ink refills then speak to the friendly staff at Ink Hub. Ink Hub's main office is based in Hillbank however we also despatch from our warehouses which are located in most states of Australia. Customers are welcome to purchase direct from our store at Hillbank 5112 or else order online or by phone. (08) 7324 3065. Ink Hub guarantees that our compatible inkjet cartridges will perform the same as the Genuine product and in most case will give a higher page yield. Customers ordering online or by phone can expect delivery with 24-48 hours if situated in metro regions. 'Most capital cities' will recieve their orders within 24 hours of ordering! We supply ink refills for all Brother, Canon, Epson, HP and most other popular printers. All of our compatible cartridges are not actually refills but brand new. A refill by definition is a genuine product which has been recycled or as it's known in the industry "remanufactured". We have found through years of experience that a quality generic cartridge is far more reliable than a refilled one as every part of it is new. If you are hesitant about using a non genuine printer cartridge then feel free to call our office and we can answer in depth any questions that you may have. Our compatible toners are also extremely reliable and we guarantee both inks and toner for 60 days after the purchase date. This guarantee is unconditional. Are you in urgent need of Generic ink cartridges and don't want to pay Officeworks prices? Ink Hub's main depot stocks most generic printer cartridges, call us and arrange to drop bye for faster service or you can order online for overnight delivery. At Ink Hub we are well known for our excellent customer service. If you have any queries relating to printers or consumables feel free to call and our friendly staff will be glad to assist with any technical queries you may have. Looking for a new printer? Not sure what to buy? Call us and we will be glad to steer you towards a printer which will be suitable for your needs. Ink Hub has been retailing Generic ink cartridges since 2007. During this time we have sold millions of non genuine cartridges and saved Australians a fortune when compared to the brand name inks. All generic ink cartridges come with a 60 Day Money Back Guarantee. If you are not 100% happy with your purchase simply call us for a full refund. We guarantee that you will be 100% happy with all of our products as we only stock the very highest quality compatible cartridges and our failure rate is almost non existent. Our prices are always lower than Big W, Kmart, Woolworths or Officeworks. Drop into our Adelaide Depot and grab a set of our generic ink cartridges or refills and start saving money today. Ink Hub offers overnight delivery to anywhere in Adelaide CBD and outer suburbs. All of our generic cartridges are posted express form our Hillbank office. Our range of generic toners may take 1-3 days as these are posted express from our Brisbane depot. We have a reputation for our speedy deliveries as we fully understand that when you are out of ink you need it fast. If you need help in choosing the right printer for your home or small business then give us a call as we are more than happy to help you select a inkjet printer to suite your needs. 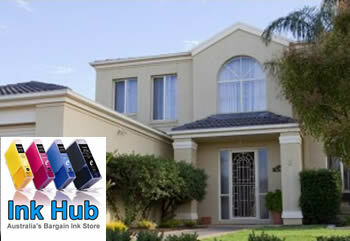 Ink Hub recommends Canon inkjet printers as they are cheap to buy and they operate very well using generic cartridges. Brother inkjet printers are our second choice and perhaps the cheapest printers of all to run. At Ink Hub we believe strongly in recycling printer cartridges. This is why we offer our services as a local Printer Cartridge Adelaide drop off point for recycling. Why throw your used toner or inkjet cartridges in the waste bin when they are perfectly fine to be re-used. By re-using them millions of tonnes of landfill is prevented annually.